Guest Relations and Campus Tours oversees the University Ambassadors program, a diverse group of student leaders who volunteer time to facilitate campus tours, host special events and represent our university in a manner that exemplifies campus pride and professionalism. Providing individual and group campus tours to prospective students, parents and other guests. Cohosting university events, such as College: Making it Happen and Explore CSUN. Hosting Cuddle ‘N’ Read, a philanthropic event that promotes literacy by raising funds and purchasing books for local first grade students in need. The event is also an opportunity for them, potentially as future first-generation college students, to visit CSUN, attend workshops and experience life on campus. Honoring faculty and staff members who have made a difference in the academic career of a University Ambassador at the annual Polished Apple Award Ceremony. To get involved, begin by submitting an application. 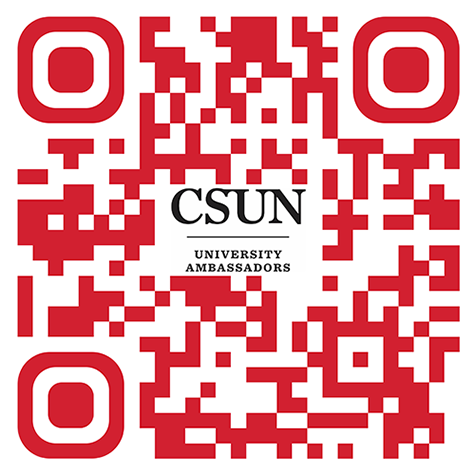 If you are interested in applying to the University Ambassadors program, please go to the online application, log in with your CSUN email and password, fill out the form then submit. Monday, Tuesday and Thursday: 9:30 a.m.-3 p.m.